A Canadian man was busted after he tried to sell anabolic steroids to an undercover police officer who responded to his online advertisement on Kijiji. The 21-year old man thought that online classified advertisements would be an easy way to stimulate steroid sales. The Guelph Police Department, in an undercover capacity, responded to the ad via email on Kijiji.ca. A face-to-face drug deal was arranged in the parking lot of a local bodybuilding and fitness gym. Police arrested the man in the parking lot and seized four different anabolic steroids valued at approximately $655. He faces two counts of trafficking a controlled substance (anabolic steroids) and two counts of possession of a controlled substaqnce for the purpose of trafficking. Kijiji is a subsidiary of eBay that was launched as a competitor to the popular U.S.-based Craigslist.com in 2005. While Kijiji is not very popular in the United States, it has gained dominant market share in the local classifieds arena in several countries internationally including Canada. Ebay.com has been illegally used as a marketplace for the sale of steroids for several years. Ebay has worked with the Drug Enforcement Administration (DEA) to limit and remove steroid listings from the auction website. The DEA has provided Ebay with an extensive list of Schedule III anabolic steroids to be used as filters to prevent the posting on steroid-related auctions. Some steroid dealers have attempted to circumvent the filters by listing the drugs as “steroid books” or “steroid DVDs”. Kijiji, while an Ebay subsidiary, does not appear to have any such filters in place. 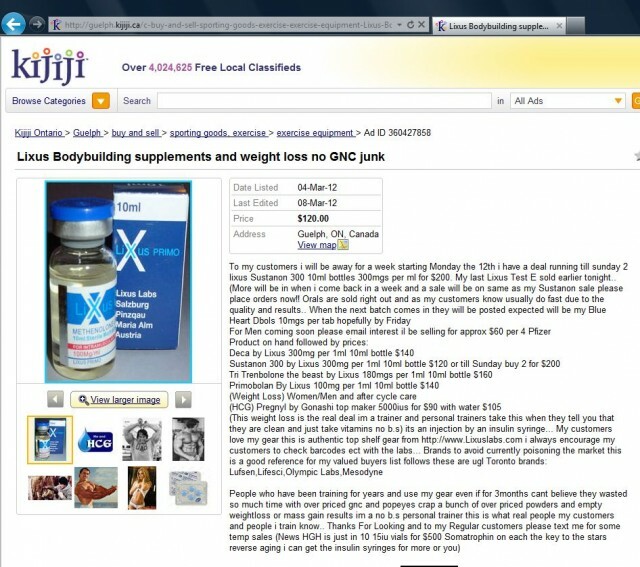 As of this writing, users of Kijiji continue to use the service to promote the sale of illicit anabolic steroids. “To my customers i will be away for a week starting Monday the 12th i have a deal running till sunday 2 lixus Sustanon 300 10ml bottles 300mgs per ml for $200,” read one Kijiji listing on March 11, 2012. T”he listing also promotes the sale of steroids manufactured by various Canadian-based underground labs (UGLs) including Lufsen, Lifesci, Olympic Labs, Mesodyne. Who Goes to Prison for Selling Steroids?